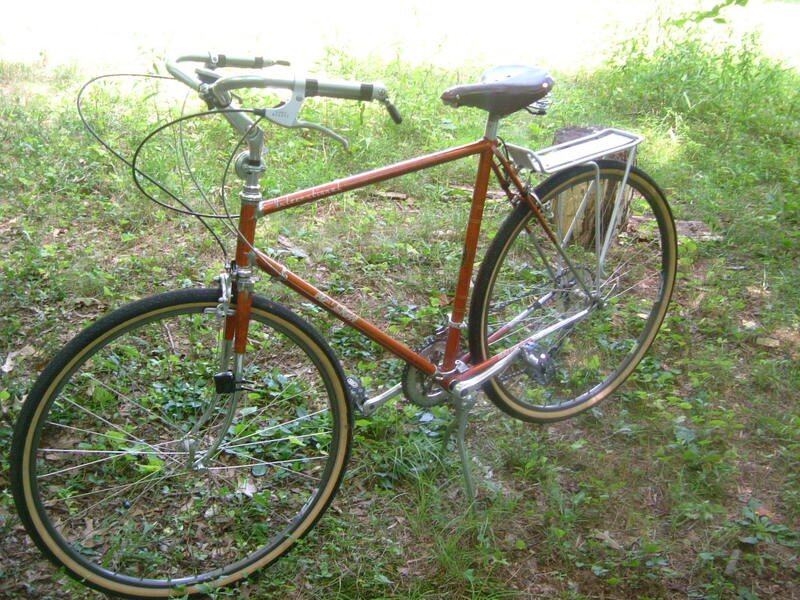 1974 Raleigh copper International 700c conversion. Panaracer Pasela 700×35 tires on Sun rims with Shimano hubs. 1980’s vintage Shimano long reach side pull brakes operated by (relatively new) Shimano BL-T400 Nexave levers. 1980’s vintage Shimano front double derailer and long cage rear derailer. Nitto Albatross bars. Suntour Bar-con shifters with “Raleigh” impressed into the rubber (a rare find). 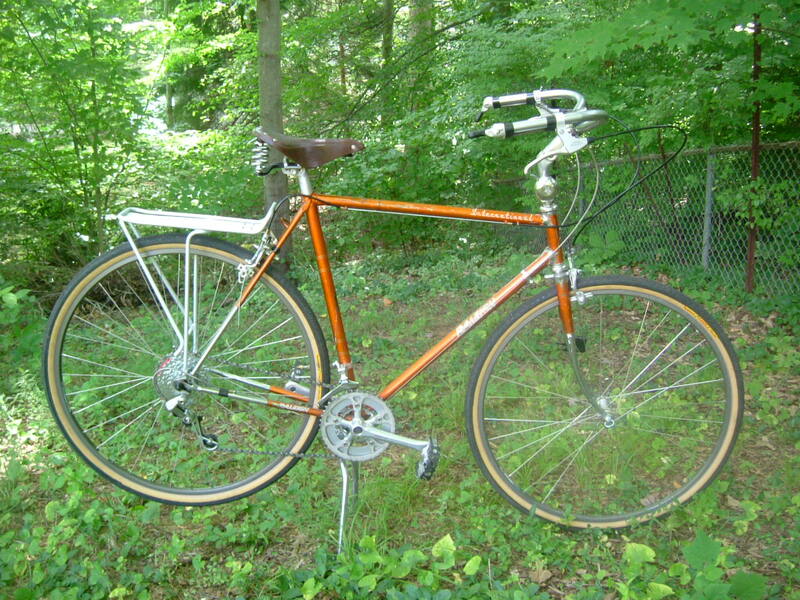 Vintage Sugino AT crank (required 127mm bottom bracket [Shimano cartridge]) with 24-42-46 chainrings (half-step + granny). Shimano 7-speed “K” 13-34 7-speed cassette with smallest two cogs swapped out with a 12 and 14 to make a perfect half-step ratio average of 9.5% (Cogs = 12-14-17-20-24-29-34). Sachs PC70 chain with powerlink. Esge double legged kickstand. B67 single rail sprung saddle. 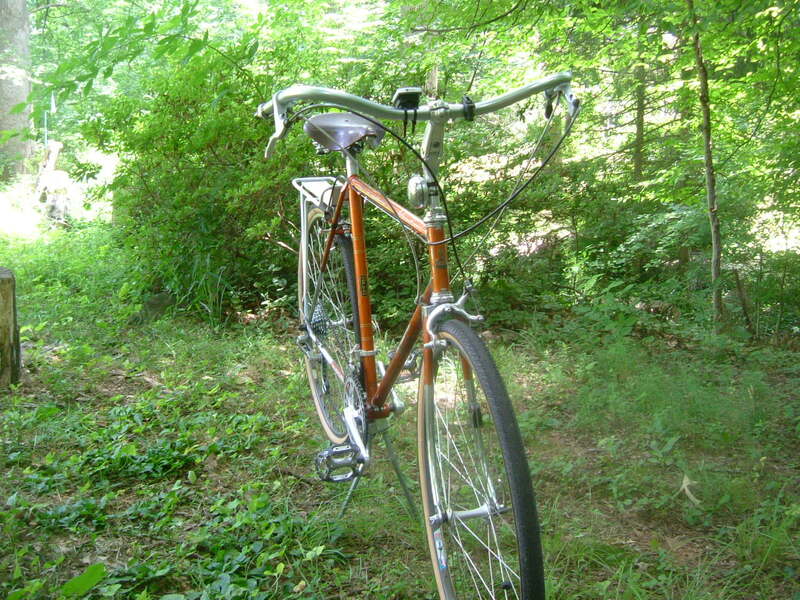 To finish this bike, we will be adding a Nitto Dirt Drop stem and some cork grips, along with some Velo Orange or Honjo aluminum fenders, perhaps a Nitto front rack and Spanninga Retroled light. No doubt this bike will at some point receive a Carradice Nelson Longflap and, for touring and errands, some of our favorite Dumpster Love Panniers. (click on the thumb for a few more pictures). Half-step gearing is not dead. We love it, and in these days of indexing and 10-speed rear cogsets, continuing to buck the industry standard still makes retro grouch sense–that is, at least, if you are a retro grouch. We are. Sadly, we are in a quickly-shrinking minority. It goes without saying that former champions of half-step gearing, among whom are (i.e., used to be) Rivendell Bicycle Works and Frank Berto (based on his article for the Rivendell Reader #14 nearly 10 years ago), seem to have given up on promoting one of the more venerable means of customizing your bike for YOU and rejecting the will of the industry standard giants who manufacture parts for their financial convenience and (like the computer industry) try to convince consumers that the gear they bought yesterday is immediately out of date. But that rant is for another post (how’s that for apophasis?–or praeteritio?). Anyhoo, if we may jump ahead a bit, purchasing Shimano K 7-speed cassettes and Sugino XD cranks is a lot like buying orgainic brown eggs at the supermarket (which we all ought to do). You are sending a message to the industry that factory farmed product is unacceptable (the organic) , and you are preserving genetic variation (the brown). Also, you are supporting an affordable price point product (that, in the case of the XD cranks, looks great as well). Good all around. Back to the point. We like 7-speed cassettes, which can be used on an 8-speed hub if you add a spacer (like, for instance, one of the spacers from your scrapped cassette (or buy a 4.5mm spacer from your local bike shop). If you take the former route, just drill out the mounting rivets and set one of the spacers of the 8-speed (or old 7-speed) cassette behind your new 7-speed cassette. Why do we like 7-speeds? Well, straight chainline setup is a snap and parts are affordable. Our preference is to use HG70 cassettes and a SRAM PC-870 chain (though the cheaper 850, and the more costly 890 chains are great, too. If you don’t know what half-step is, you might want to quit reading now and just go ride your bike. But if you must know, it is a ratio formula where the average of the percentage of difference between your rear cogs is calculated, and your largest two chainrings are set up to provide half the average percentage of the rear. This eliminates duplicate gears so commonly found on cranksets that have 10 tooth jumps between the large rings. To illustrate, a 42-46 half-step double up front with the cog setup we describe here provides 14 usable gears with no duplicates (a triple will provide 17 of 21 usable gears). Conversely, a 36-46 double with a standard 8-speed 13-30 or 12-28 cogset would provide only 10 gears (12 with a triple)–the rest would be duplicates. Dumb. There are some downsides to half-step. Not many, but some. First, you should get rid of your indexed shifting at the front derailer, but if you need that (or even indexing in the rear), you are probably at the wrong site or reading the wrong post on this site. It is also necessary to set your front derailer slightly higher than factory specs, especially if you have a triple front mtb derailer. With a half-step triple, you can use a road double front derailleur just fine (especially if you use a Sugino XD crank with a 46-tooth large ring. A modern road double is designed to cover a 42-52 range, so you will have to lower the derailer a bit to get it close to the 46 toothed chainring (though it will still be a bit high), and the long drop in the rear will allow the use of several gears from the third granny ring (if you have one). Second, some people, the late (and formidable) Sheldon Brown being one of them, maintain that half-step gearing with 6 or more cogs creates a situation in which the chain is deflected at too great an angle. This is not wholly untrue, but we believe that modern chains allow for far more deflection than those of yore. Moreover, once you get down below, say, 40 gear inches or so, you will be going up a pretty steep incline, so it is more common for a rider to appreciate wider low range shifts, and therefore the tendency to use the “bad combination” of the large ring with the large cog is seriously minimized (note, too, that the same gear can be obtained on the 24/17 combo, and this combo has an acceptable chainline). It must also be mentioned that many riders use all three of their chainrings on all of their cogs; but that smacks of their not having a clear knowledge of bicycle gears and how to properly use them. Still, these riders get through their shifting sequences with impunity, so even the chain deflection argument is mollified by this fact. 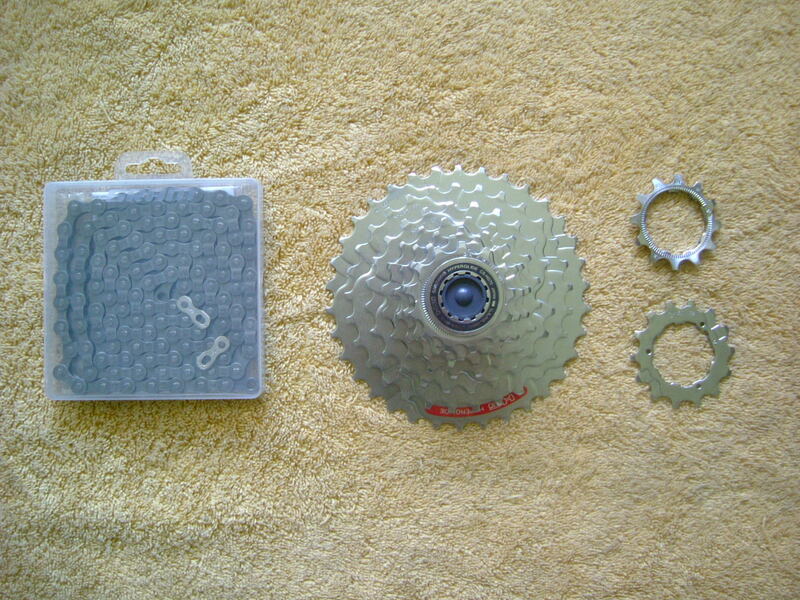 (If you have an 8-speed hub), a spacer–either a proper one ($$) or a recycled spacer from a 7- or 8-speed cassette. If you have a 7-speed hub, forget the extra spacer. You don’t need it. You might need to fool with the bottom bracket width to get a perfect chainline from the center ring to the 4th cog, but that is your job. You can also read our page on modifying a Shimano bottom bracket to give it infinite adjustment (see Phil-Woody bottom bracket under the articles page). OK, if you are going to go with the two cassette approach, you will need to remove the rivets from both cassettes. 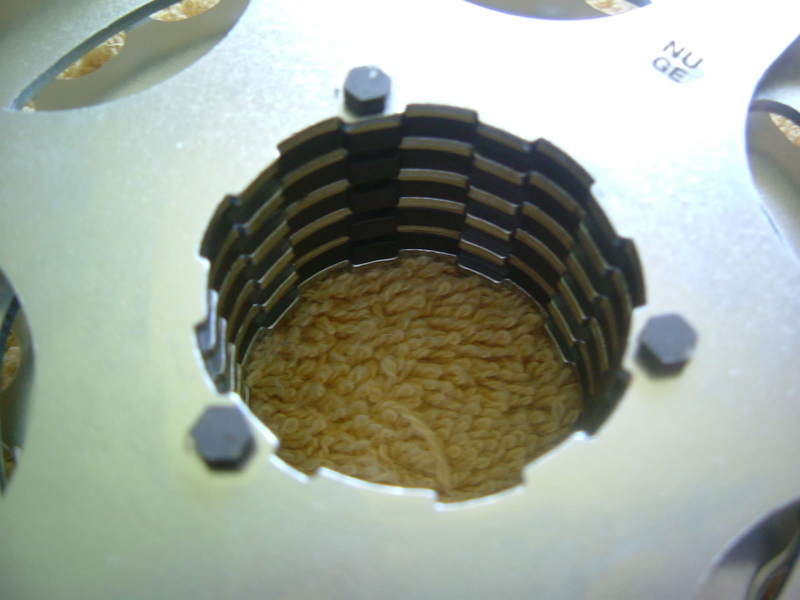 From the back side, unscrew (some are bolted, others riveted) or drill out/grind off the rivets and use a narrow punch to drive the three rivets from the cogs (once you get the rivets started, you can grab them from the front with pliers and wiggle them free. Plan on swapping out the stock 13-tooth cog for the 12, and the 15-tooth cog for the 14. Now you are ready to go (at least in the rear). Or, you can just put on the stock K cassette and not go through the expense of buying two cassettes or hassle of drilling rivets out (more on the single cassette below). For the chainrings, remove the 36 and replace it with a 42. Done up front. Install your bottom bracket and get your new chain and front derailer set up. Now to ratios and gear inches. if you go with the two cassette approach, you will get a rear cog percent average of 18.95%. A 42/46 front chainring combo will give you (drumroll)… 9.5%, which is a perfect setup. For your granny, if you use a 24-tooth innermost chainring you get (with 700cx35 tires) a low of 19.3 gear inches and a high of 104.7 (which is really higher than you probably need). A 26×1.5 tire would give you 19–95.3 inches (so you could even stick with a 26 toothed innermost chainring if you ride on 26 inch wheels). If you go with a stock K cassette, you get a little duplication on your 42/15 and 46/17 combos, but that duplication is right in the 60+ gear inch range, which is where the majority of people spend most of their time while riding. Your top end will be in the 88-ish inch gear range, which is a good usable high gear for most of us. Still, if you want over 100 gear inches, get a spare cassette and pirate the 12 and 14 tooth cogs from it. Remember, with a 7-speed setup, you should not use the 46/34 combo (which is duplicated with the 24/17 [and you would probably want to be in the 42/34 or 42/29 anyway]), and you should not use the 24/12 or the 24/14 for fear of both chain deflection and chain slap, should your derailer not be able to take up all the slack in the chain. Now to address the naysayers. First, they will say that the jumps in the rear are too far apart. Not so. Many modern bike, especially mountain bike, cassettes (whether 7- 8- or 9-speed) have 13-15-17-20 or 13-15-17-19 cogs somewhere in their sequence, so you are not departing from the industry standard there–you are just getting rid of duplicate gears throughout your system–and you can still just stay in your middle ring and use the gears as the cassette is set up (which is to say, ride it like the incognoscenti do) and you feel like anything is out of the ordinary. Know, too, that with a 46 tooth large ring up front, you don’t need an 11 tooth small cog in the rear–the 11 toothers were designed for compact mountain triples whose large chainring has 42 teeth. Second, which is on the same topic of supposed too-large jumps in the rear, go for a ride with a few people and listen to the shifter clicks of the roadies or mtb’ers who have indexing with closer ratio cogsets. They often shift twice in the rear in immediate succession–this suggests that their rear cogs are actually too close together for practical use (and they are ending up with 18 to 30% shifts in the rear as a result, depending on the cassette they use). The percentage jumps of our preferred cassette set-up, at 18%, feel natural, and immediate double shifting is much less frequent. Third, the naysayers will claim that you have too small a jump up front and way too large a jump from the inner to the middle chainring. Well, you will have a small jump up front, but again, you have eliminated duplicate gears; and you will have a big jump into and out of the granny, but we do not find the 18 tooth jump up or down to hold our front derailers back, so the point is moot. Fourth, doubters will say that the shifting sequence with half-step is a PITA (i.e., shifting at the rear and at the front back to back). Again, with our 7-speed combo, the cog jumps are not out of standard percent range for many bikes on the road with 7- 8- or 9-speed systems. The PITA claim goes back to the days of 4- and 5-speeds when there were huge jumps in the rear and it was necessary to follow up a shift in the rear with a shift in the front (an example would be the classic SunTour 14-17-21-26-34 5-speed freewheel with a 48-52 front combo (and very old front derailers were designed for very small jumps in the front. With complaints against half-step debunked, we’d like to mention, a few more benefits half-step has to offer. First, if you tour, particularly on flat terrain with shifting winds or gradual grade changes (think Kansas), you will be able to dial in a perfect gear, and you will be staying in that gear for miles and miles. Second, larger cogs (like a 13 tooth small) wear much slower than smaller ones (like 11 teeth), so you get more longevity from your gears. Third, most of your cruising range will be in the high 60’s to mid 70’s gear inches on your 17 and 20 tooth cogs, and these cogs are in the center of your gearing system, so your chainline will be at minimal deflection (which means less chain and cog wear, as well). Finally, you will have customized your gearing for YOU (and the recommendations in this article are by no means the only way to customize your gearing), and not let industry fads dictate your riding experience.